This book outlines the post-war history of the Shelley factory and documents the post-war cup shapes and backstamps. 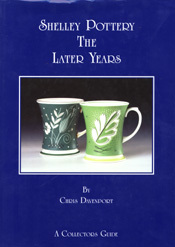 The majority of the book lists the best and second ware and Ideal China china patterns. Sections on nursery and gift ware are also included. This hard back book is slightly over A4 size and its 240 pages are illustrated with colour pictures. The publication is a must for any Shelley collector specialising in the post-war period. Without even reading a page, the immediate impression of this book is one of high quality. The hard backed cover is cloth bound in blue with the title gold blocked and the pages are of a substantial gloss paper. The presentation is completed with a blue dust wrapped picturing Eric Slater mugs on the front and Mabel Lucie Attwell figurines on the back. The first edition is limited to one thousand copies and these are numbered and signed - a nice touch. For the majority of Shelley collectors it has been a strange anomaly that the most recent years of production from the factory have been the least documented. Chris has been working of this collectors guide for some years, to fill the gap, whetting our appetites from time to time with snippets of information from his researches. There will obviously be comparisons made with the earlier Shelley and Wileman books but this volume complements the others and seeks to complete the story of the output from this family company until its closure in 1966. The author had the benefit of personal contact with members of the Shelley family and staff who had worked in the factory, adding personal details to official records. The book opens with the story of the Shelley Potteries, restricted during the austere war years of 1939-1945 but subsequently able to grow and develop home and foreign markets with a widening range of patterns and designs. The guide concentrates on tea and coffee ware and details information on best ware, Ideal China and second ware from 1939-1966. Cup shapes are illustrated by excellent black and white photographs accompanied by the name, additional information and dates where known. Although old favourites such as Dainty, Queen Anne, Regent and Gainsborough are shown, there are also new shapes - such as Athol, Ludlow and Warwick to search for. Cups lead on to a useful illustrated page of tea and coffee pot shapes and a list of the composition of sets. Before the major listing of patterns is a guide to colour numbers and a glossary of terms used in the pattern books. Another section gives information on nursery ware artists employed by Shelley, and gift ware with many colour plate illustrations of these ranges. The war years caused the cessation of all but practical tea, coffee and dinner ware. The luxury goods, with a very few exceptions, were not made again. Only Mabel Lucie Attwell figurines and a few possibly sample or trial vases are shown. The real meat of the book is in the huge list of pattern numbers with accompanying descriptions offering a wealth of information on the output of twenty-seven years. Unfortunately the pattern books did not consistently record dates against the numbers until 1955 but some earlier dates are noted. To illustrate patterns and shapes, the listings are generously interspersed with colour pictures of the fine bone china ware. Each colour plate has a listing of the pattern numbers illustrated but not the individual shapes. For the statistically minded the book as a total of two-hundred and seventy-seven pages of which thirty-three are full colour and a further twenty-four have monochrome plates. There is little to be critical of in this splendid guide but I would have liked to see some dinner ware information and illustrations. Although of minor importance compared with the tea and coffee ranges some delightful sets were produced post-war and these must have contributed to the factory output over the years. The Later Years will be an indispensable aid to all post-war Shelley collectors. Chris Davenport-with valuable assistance from his partner Heather-is to be congratulated on filling the gap in the Shelley collectors' source of information and completing the picture of the Wileman/Shelley later years. The guide is well researched and beautifully presented. If you have any interest in Shelley fine bone china 1939-1966 this book is a must.